Most of these principles have provided reasonable recommendations on sound governance structures and processes. In the main, these guidelines outlined the duties, responsibilities and rights of different stakeholders. In the pre-globalisation era, non-shareholding stakeholders of business firms were in many cases sufficiently protected by law and regulation (Schneider and Scherer, 2015). In the past, the corporate decisions were normally taken in the highest echelons of the organisation. The board of directors had the authority and power to influence shareholders, employees and customers, among others. Sharif and Rashid (2014) suggested that non-executive directors had a positive impact on the CSR reporting. Moreover, Lau, Liu and Liang (2014) examined how board composition, ownership, and the composition of the top management team could influence corporate social performance. However, with the diminution of public steering power and the widening of regulation gaps, these assumptions have become partly untenable (Lau et al., 2014). In many cases, stakeholders of business firms lack protection by nation state legislation. Notwithstanding, with the inclusion of stakeholders, corporate governance may compensate for lacking governmental and regulatory protection and could contribute to the legitimacy of business firms (Miller and del Carmen Triana, 2009). Schneider and Scherer (2015) argued that the inclusion of stakeholders in organisational decision processes on a regular basis can be regarded as the attempt of business firms to address the shortcomings of a shareholder-centred approach to corporate governance. The casual consultation with stakeholders is often characterised by unequal power relations (Banerjee, 2008). Previous research may have often treated the board as a homogeneous unit. However, at times there could be power differentials within boards (Hambrick, Werder and Zajac, 2008). Boards are often compared to other social entities, in that they possess status and power gradations. Obviously, the chief executive will have a great deal of power within any organisation. In addition, the directors may include current executives of other firms, retired executives, representatives of major shareholders, representatives of employees and academics. Who has the most say? Is it the directors who hold (or represent) the most shares or does it reflect the directors’ tenures? Alternatively, it could be those who hold the most prestigious jobs elsewhere, or the ones who have the closest social ties with the chairman. These power differentials within top management teams could help to explain the firms’ outcomes. Ultimately, the board of directors will affect processes and outcomes. A more macro perspective on informal structures opens up new questions regarding the roles of key institutional actors in influencing the public corporation (Hambrick, Werder and Zajac, 2008). Although researchers have long been aware of different shareholder types, there has been little consideration of the implications of shareholder heterogeneity for the design and implementation of governance practices. Managers and shareholders, as well as other stakeholders, have wide variations of preferences within their presumed categories. For instance, there are long-term- and short-term-oriented shareholders, majority and minority shareholders, and active and passive shareholders. In addition, the rise of private equity funds have created a whole new shareholder category, which is becoming more and more influential. The idea of heterogeneity within stakeholder categories, including diversity among equity shareholders, will become a popular topic in future governance research (Miller and del Carmen Triana, 2009). Growing shareholder activism raises questions that could have been overlooked in the past. Who runs, and who should run the company? Corporate governance does not begin and end with principals, agents, and contracts. Beyond the obvious roles of regulatory authorities and stock exchanges, we are witnessing an increasing influence from the media, regulatory authorities, creditors and institutional investors, among others. These various entities may have a substantial effect on the behaviours of executives and boards of public companies. Arora and Dharwadkar (2011) had suggested that effective corporate governance could discourage violation of regulations and standards. Jizi, Salama, Dixon, Stratling (2014) examined the impact of corporate governance, with particular reference to the role of board of directors, on the quality of CSR disclosure in US listed banks’ annual reports after the US sub-prime mortgage crisis. Jizi et al. (2014) implied that the larger boards of directors and the more independent ones are in a position to help to promote both shareholders’ and other stakeholders’ interests. They found that powerful CEOs may promote transparency about banks’ CSR activities for reputational concerns. Alternatively, the authors also pointed out that this could be a sign of managerial risk aversion. Recently, many businesses have linked executive pay to non-financial performance. They tied executive compensation to sustainability metrics such as greenhouse gas (GHG) reduction targets, energy efficiency goals and water stewardship, in order to improve their financial and non-financial performance (CERES, 2012). Interestingly, the latest European Union (EU) Directive 2014/95/EU on non-financial disclosures EU directive has encouraged corporations and large undertakings to use relevant non-financial key performance indicators on environmental matters including; greenhouse gas emissions, water and air pollution, the use of (non) renewable energy and on health and safety (Camilleri, 2015b). Abbott, L. J., Parker, S., Peters, G. F., and Rama, D. V. (2007). Corporate governance, audit quality, and the Sarbanes-Oxley Act: Evidence from internal audit outsourcing. The Accounting Review, 82(4), 803-835. Arora, P., and Dharwadkar, R. (2011). Corporate governance and corporate social responsibility (CSR): The moderating roles of attainment discrepancy and organization slack. Corporate governance: an international review, 19(2), 136-152. Banerjee, S.B. (2008). 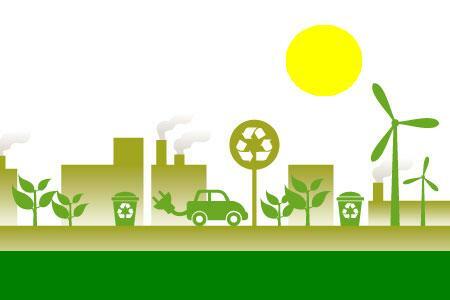 Corporate social responsibility: The good, the bad and the ugly. Critical sociology, 34(1), 51-79. CERES (2012). 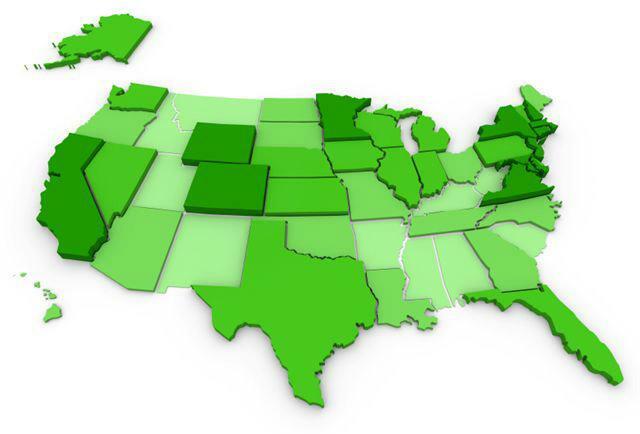 Executive compensation tied to ESG performance. The CERES roadmap for sustainability. http://www.ceres.org/roadmap-assessment/progress-report/performance-by-expectation/governance-for-sustainability/executive-compensation-tied-to-esg-performance-1 accessed on the 2nd February 2016. EU (2014). EU adopts reporting obligations for human rights and other “non-financial” information. Lexology http://www.lexology.com/library/detail.aspx?g=41edd30b-e08c-4d26-ba6f-b87158b5ee85 accessed on the 10th February 2016. Fuentes-García, F. J., Núñez-Tabales, J. M. and Veroz-Herradón, R. (2008). Applicability of corporate social responsibility to human resources management: Perspective from Spain. Journal of Business Ethics, 82(1), 27-44. Hambrick, D. C., Werder, A. V. and Zajac, E. J. (2008). New directions in corporate governance research. Organization Science, 19(3), 381-385. Jizi, M. I., Salama, A., Dixon, R. and Stratling, R. (2014). Corporate governance and corporate social responsibility disclosure: Evidence from the US banking sector. Journal of Business Ethics, 125(4), 601-615. Jones, I., and Pollitt, M. (2004). Understanding how issues in corporate governance develop: Cadbury Report to Higgs Review. 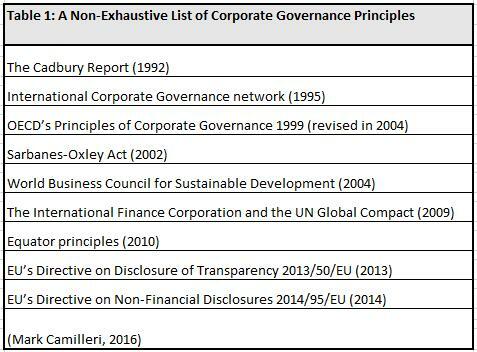 Corporate Governance: An International Review, 12(2), 162-171. Lau, K. L. A. and Young, A. (2013). Why China shall not completely transit from a relation based to a rule based governance regime: a Chinese perspective. Corporate Governance: An International Review, 21(6), 577-585. Lazonick, W., and O’sullivan, M. (2000). Maximizing shareholder value: a new ideology for corporate governance. Economy and society, 29(1), 13-35. Miller, T. and del Carmen Triana, M. (2009). Demographic diversity in the boardroom: Mediators of the board diversity–firm performance relationship. Journal of Management studies, 46(5), 755-786. Schneider, A. and Scherer, A. G. (2015). Corporate governance in a risk society. Journal of Business Ethics, 126(2), 309-323. Sharif, M. and Rashid, K. (2014). Corporate governance and corporate social responsibility (CSR) reporting: an empirical evidence from commercial banks (CB) of Pakistan. Quality & Quantity, 48(5), 2501-2521.